Am I Crazy Or What! 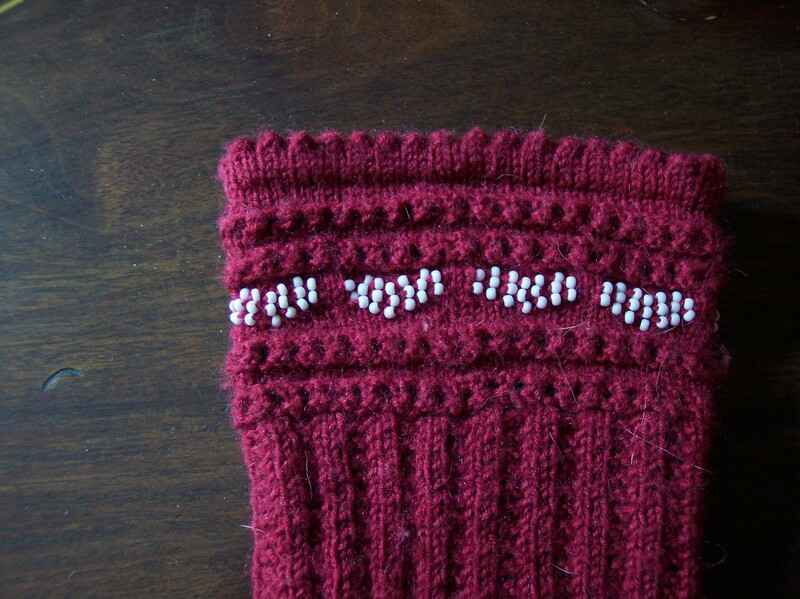 Back in 2004, I knitted a pair of The Knitter Sock Of The Month Club socks called Valentine Hearts, design by The Knitter herself, Judy Alexander. The hearts in the design are formed using beads. Teeny, tiny 8/0 white glass seed beads. Making these sock entailed stringing a bunch of said tiny, round, elusive white seed beads onto the yarn, then pushing the beads down the working thread until I needed one, at which time I then had to move the bead back up the working yarn to get it in the proper place. 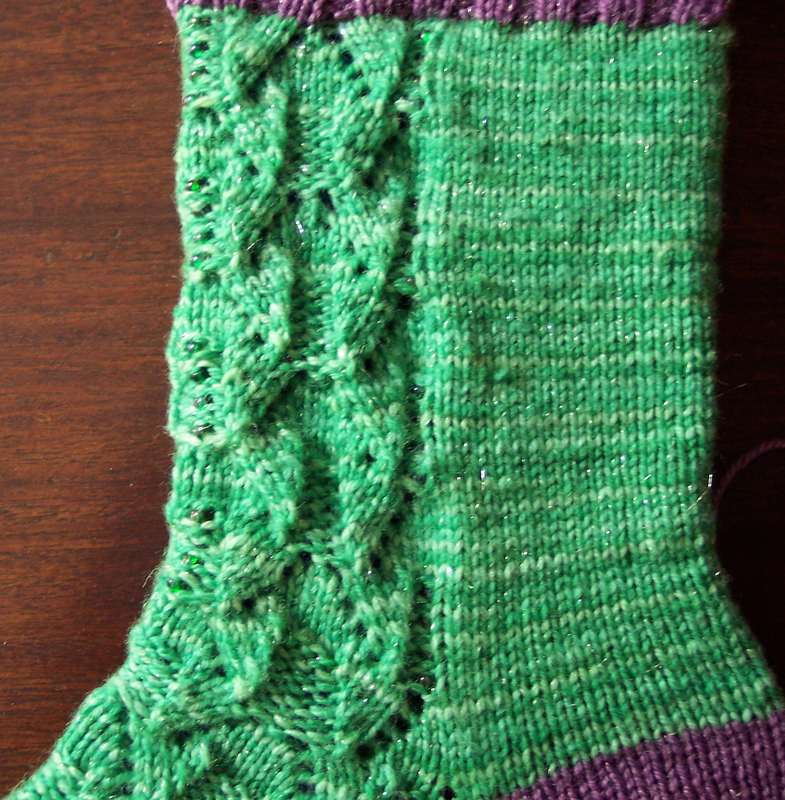 When I had finished the socks, I thought, Never again! Although I loved the finished socks, I didn’t enjoy fiddling with the beads. When I later received another SOTM sock kit that included beads, I put the beads away (yes, I still have them, and yes, I know where they are), stuck the pattern in the appropriate binder, and stashed the yarn in my sock stash. No more beaded knitting for me. Fast forward to 2011. Another sock kit arrives, this one from Brynna at Draygone Yarnes. Oh, no! There are beads. The beads are optional, of course, but there’s also a very tiny crochet hook included in the kit. What’s this? A different technique for for adding beads to knitting? I’ll give it a try. So I knit these socks, adding the beads as I went using the tiny crochet hook, and guess what! I didn’t hate it. In fact, I rather enjoyed it. Yeah, it surprised me, too. Maybe I wrote off beads too soon. I started to consider maybe doing some more beaded knitting at some time in the distant future. The “Sparks” pattern kind of sparked my feeble brain to pondering what “Sparks” would look like translated into brightly colored beads. Step 1, figure out what size beads to use. I turned to the Internet for the answer to this question, but the Internet was no help. Contrary to what certain web sites said, 6/0 seed beads DO NOT fit worsted-weight yarn. Ask me how I know. Go ahead, ask. That’s right. 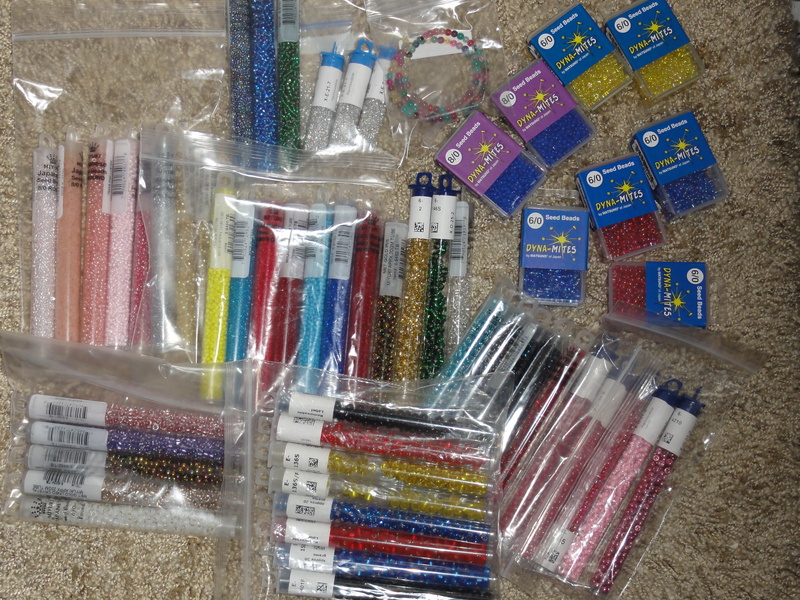 I ordered 6/0 seed beads, lots of them, in shades of blue, red, and yellow. When the beads arrived, I discovered that my yarn was too thick to fit through the hole. I needed larger beads. Seed beads larger than 6/0 are not easy to find, but I finally found some 5/0 seed beads at Caravan Beads in the colors I needed. By this time, I had an idea for another square using beads, a practice square, so to speak, that had black and gold stripes, so I added black beads to my order. When the beads arrived, I was happy to discover that the yarn would fit through the hole, though just barely. I went to work on my practice square. Because the yarn was so thick, I had to use the stringing technique because the crochet hook technique requires two strand of yarn to be pulled through the hole and that just wasn’t working with the worsted weight wool. So stringing the beads on the yarn before knitting was my best option. If you are using just one color of bead, the only care you need to take is to string the proper number of beads. But because I was doing black and gold stripes, I had to place the proper number of the proper color in the proper order (backwards). Not as easy as it sounds for someone who is as easily distracted as I. LOL But after doing the math, which is always a challenge for me, and stringing the beads, and double-checking the count and order, I set to work. I tried a couple different methods for placing the beads and settled on the “slip the stitch purlwise with the yarn in front, slide the bead into place on the working yarn, then knit the next stitch” method, which worked very well for this design. The beads sit nicely on top of the knitting and are quite visible. Yes, this is the techique I used when knitting the Valentine socks. I don’t know why I hated it so much then. It was a piece of cake, really. Anyway, since the practice square was a big success, I set to work on “Sparks.” This design was a much bigger challenge. First off, I had to decide just where to place the beads, then how. This was much more complicated that it might seem at first glance. 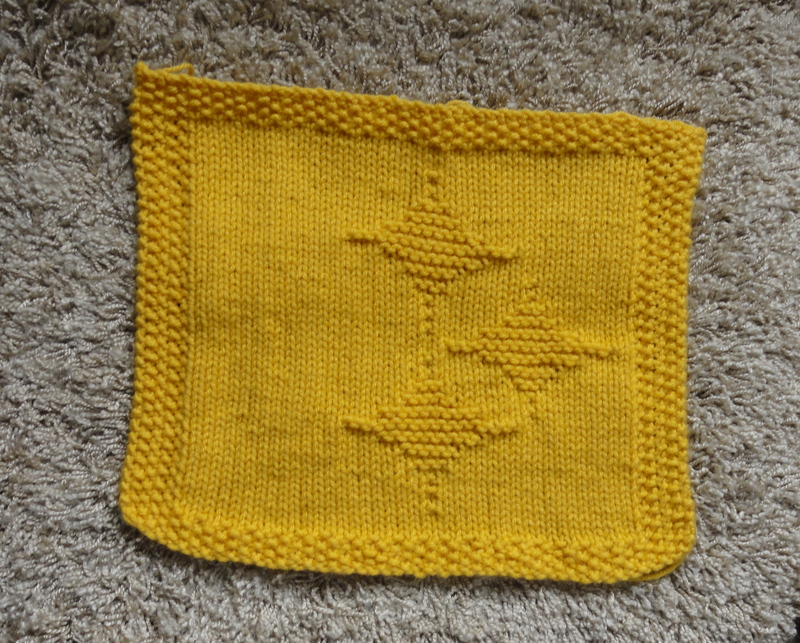 I was going to use the same technique as for the black and gold stripes square, so that meant placing a bead every other stitch, every other row. This wreaked havoc with the math because, well, the numbers just didn’t fit with the design. Odds and evens and all that. Back to the drawing board. I thought to actually knit the beads into place. I strung some and gave it a try. This might work, I thought, although I was fearful that adding a bead to every pattern stitch in the design (basically knitting a bead where the design has a purl stitch) might crowd the beads. It didn’t, but what did happen is that the spark was not the correct shape. Knitting the stitch instead of purling it changed the shape of the spark because knit stitches and purl stitches are different sizes and shapes. Duh! After much ripping out and reknitting, I finally hit on the idea of simply knitting the pattern as it is written, that is, using purl stitches to make the design, but adding the beads while working the wrong side rows. I actually purled the beads into the pattern. At first I was afraid the beads would disappear into the right-side purl stitches, but they didn’t. Really, I don’t know why I didn’t do the design this way from the very beginning. I could have save myself a lot of frustration. Then I had to figure out how many beads I needed of each color and string them in the correct order. For the most part I succeeded at this, but when I got to the place where the red and gold sparks overlap, I realized that I hadn’t strung the beads correctly. Did I panic? Of course not. I just cut the yarn, restrung the beads properly, and went right on knitting. 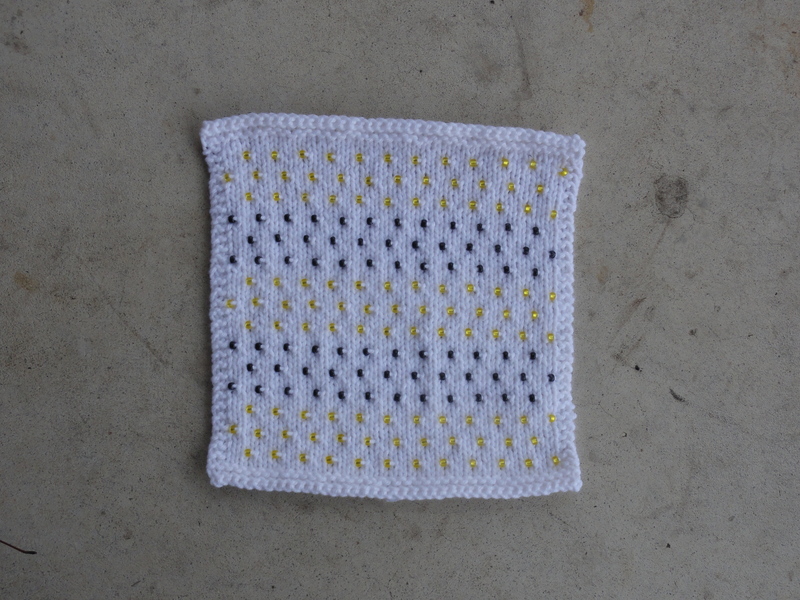 In spite of all the difficulties involved, I had a lot of fun making this square. Both of the beaded Steelers squares have found a home with ish147 herself, a token of my appreciation for all her work in organizing this KAL and for her friendship, which means a lot to me. And now that I’ve discovered that adding beads to knitting is lots of fun, I’m working on a bead stash. Beads can be addictive! Who knew!?!?!?! 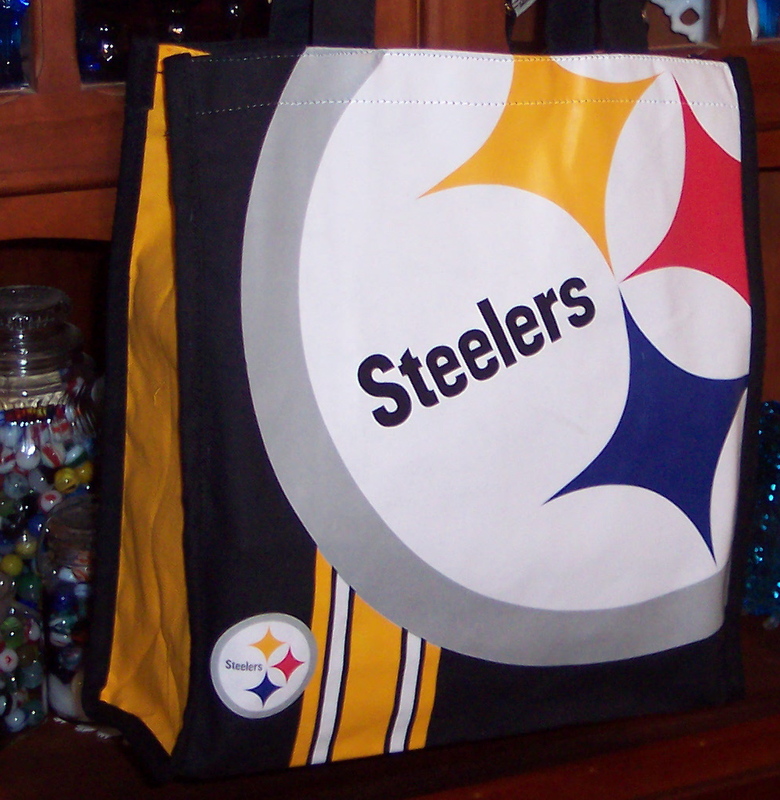 This entry was posted in Knitting and tagged 5/0 round seed beads, beaded knitting, Steelers knitting. Bookmark the permalink. 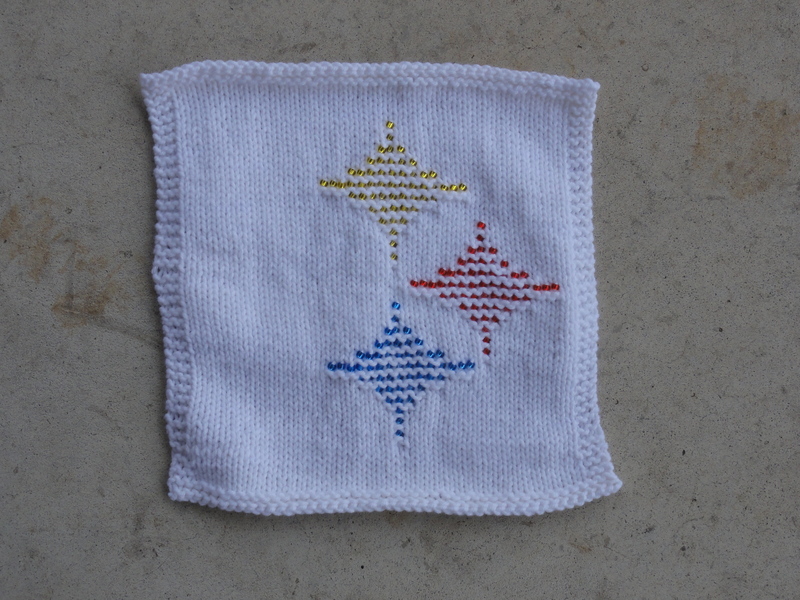 Is there a pattern available for the Steelers squares, including the beaded ones?